Where does the west/south begin? What cities make up the borderline to the west? many people say KC is a major city set on the borderline to the west. Where does the south begin? many people say KC is a major city set on the borderline to the west. Where does the south begin? 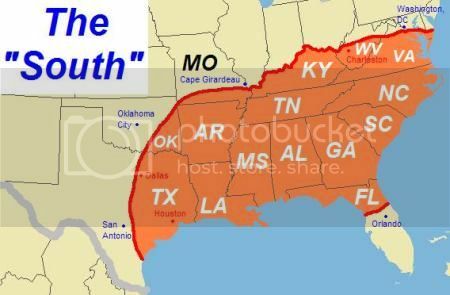 I'll definetely agree, and say the south begins nearly as soon as you enter Arkansas, and continues west until just past Dallas and Houston. Just my opinion.. This the most accurate map I've seen. Possible cities that border between the west and south is Phoenix, Las Vegas, Albuquerque or Denver. The Rocky MOuntains play a part in separating the west naturally from the Midwest. I'd say the west starts in Kansas City, KS... KCMO is a midwestern city and in no way western.. We are a gateway to the west (yes that is STL's nickname and they have the arch, but KC is just as much a gateway as they are), but not a city of the west. STL is definately the traditinoal gateway to the west, but I could justify giving that title to KC. Any city in any state North and West of Texas is not in the South at all. Although that may be considered the south and west, I believe we're getting at what has the feel of it. For instance, southern Florida doesn't really have much of a traditional "South" feel to it. The only place in Southern Florida that doesn't have a tradition southern feel to it is Miami, because of its cultural diversity. Everything south and west of Miami feel like any place else in Florida. However, like Central Florida, its still a part of the South, despite what the orange map claims. Anywhere east of that line is the South. Anywhere west of that line is the West. Tulsa and Oklahoma City don't count in the South. Everything south and west of Miami feel like any place else in Florida. However, like Central Florida, its still a part of the South, despite what the orange map claims. Naples, Fort Meyers/Cape Coral, that area doesn't feel southern. Neither does Key West, and those all lie west or south of Miami. Have you been to Naples/Ft. Myers? Naples is home to the one and only swamp buggy races. It doesn't get more southern than that. The area is generally higher income retirees and very suburban in nature, but it's just as southern as any other well to do suburb of Atlanta or North Carolina. Pehaps the homegenization of american culture is higher in places like Naples, Orlando and Tampa, but these places still have a distinct souther tint to them. I always forget how southern Florida really is. Then I leave Miami and it hits you in the face. The first question I'd ask you is what characteristics do you associate with being southern? Do you consider a city with a unique feel to it like New Orleans southern? What's the difference between Naples or Hilton Head, SC, other than Naples being larger? Anyway, several South Florida cities like Homestead, Florida City, Immokalee, Clewiston, Belle Glade, etc. feel just as southern as any city in the southern region of the US. Hilton Head is a Yankee Colony. Tts a damn nice one though. Its still southern though. I still don't understand what makes a place "southern". It seems like many think that any place that embraces several cultures, is unique or dense, etc. isn't "southern". Seriously, everytime these type of threads come up, it seems like its a bad thing or disrespectful to be labeled southern? Even the orange map is corny. Just take Jacksonville, for example. While the rural western areas of the city are "dixiefied", the beaches like Ponte Vedra or Amelia Island, don't resemble that at all. Plus, the inner city has developed and feels more like a Midewestern city than many well known southern cities. So, what do you call a place that doesn't fit the southern stereotype, yet is located in the heart of the south, like Jax or even present day Charleston, SC? Well, it just didn't feel as southern in Naples. And yes I consider New Orlenas southern... Whoever wouldn't is kinda crazy. Spend a couple weeks in Minnesota, and you'll discover how much places such as Jacksonville, Charleston, and New Orleans have in common. I've spent a lot of time in Detroit, Buffalo and DC over the years and other then built environments (which I associate with age, instead of region) they didn't feel that much different from being in Florida. In fact, inner city Jax feels like a smaller version of Detroit, architectural and cultural wise. Fort Worth - Where The West Begins. At least that's their city slogan.